High factor sun protection (UVA & UVB) for sensitive skin. The best formula we have found that combines high factor protection with minimal skin whitening. It is a very runny milk style formulation so you only need a small amount, making this tube very good value. It is packed with organic plant oils such as jojoba and argan (anti ageing) which are usually found in facial skin care so it is very moisturising for the skin. 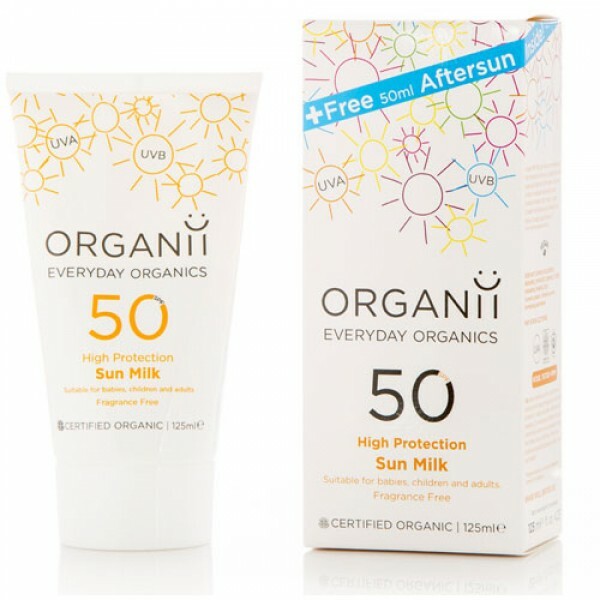 This organic sunscreen is different from any other I've tried before in a very positive way. The rich texture blends completely with the skin, leaving it silky soft and very well protected. Protects very effectively and fights any kind of skin reaction to the sun. Will be my sunscreen choice forever now. aqua (water), pongamia glabra seed oil, dicaprylyl ether, zinc oxide, caprylic/capric triglyceride, polyglyceryl-3 polyricinoleate, glycerin, alcohol*, olea europaea fruit oil, titanium dioxide, oryza sativa bran oil, linum usitatissimum oil*, tocopherol, alumina, stearic acid, pongamol, helianthus annuus seed oil*, simmondsia chinensis oil*, argania spinosa kernel oil*, hydrated silica, oryzanol, magnesium stearate, calendula officinalis flower extract*, malva sylvestris leaf extract*, bisabolol, magnesium sulphate eptahydrate, stearic acid.